It would seem necessary to acknowledge some connection between business and elite academia, in view of the importance of research grants to the academy, and business and mainstream media, in view of the importance of advertising to shaping consumer behavior. It may also be useful to distinguish between the productive and distributive entities in business, since research grants from industry drive hard science, while finance and foundations tend to make grants to the soft sciences and humanities. I should have better said "some influence from business to elite academia," I see, since you indeed have influence running from elite academia to business . . . I see your point, but I'm not sure that's really more significant than the "everything affects everything else" level. 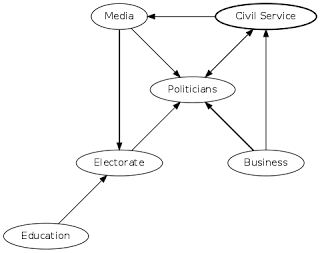 If I was breaking out elite academia in the first diagram, I would show influence from business there. But while donors might get support, or at least silence, in the short term, I don't think they significantly change what academia believes about any issue. Perhaps the key thing I'm missing in these diagrams is the social grouping. The point about elite academia and the media is that they're the same people, socially. Some of the business group (notably financiers), are largely also the same people. Many politicians too. Bankers give money to elite academia because they're the same people, believe the same things, and see it as a price of social respectability. Thanks for the suggestion, anyway. "Janet Napolitano, the US Homeland Security Secretary, is to resign from her position to become president of the University of California system"
The social links of key Cathedral priests (and priestesses) has been the precise subject of Scharlach's recent series over at http://habitableworlds.wordpress.com/2013/07/09/profiles-of-cathedral-clerics-2/ . I'd bet he'd appreciate a hand. Indeed, the differential in influence of elite university graduates (upon every organ of opinion, coverage, and policy) relative to ordinary universities & institutions is probably higher than ever and growing… and likely growing at a higher rate than ever. I think your visualizations are a good start. One of the things James Goulding would like to see is a thorough description of "how the Cathedral works," and I think this analysis should proceed from both ends, macro and micro. My last couple posts on "Cathedral clerics" has begun the analysis at the individual level, but even if I get 100 profiles up, they will still be a collection of case studies without some macro theorizing about the flow of power, influence, law, and enforcement in the Cathedral. I don't know why "alvarez80" is popping up here. This is Scharlach. Alvarez is the old handle I used for a couple months when I first started commenting anonymously. Yes, Marx, Trotsky, Freud, Soros, Friedan, Alinsky, Gould, Boas, Sontag, Chomsky. Very Cathedral-y. Moldbug is not being honest.